Just last night while perusing my Twitter feed, I noticed a link to an origami documentary, titled Between the Folds... what timing, considering yesterday's post about origami artist Ilan Garibi! 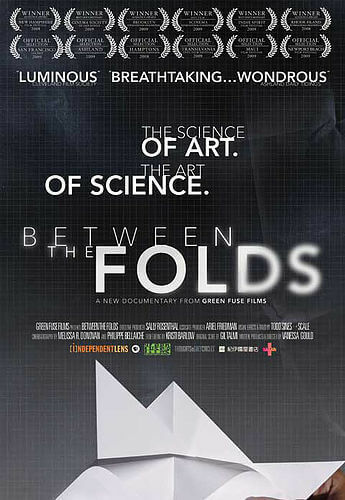 The award-winning film is described as "A documentary exploring the science, art, creativity and ingenuity of many of the world's best paper folders." Even better than awaiting the release of the DVD on Netflix, I'm happy to report that the PBS television show, Independent Lens, will premiere the film beginning December 22nd for those of us in the U.S.
You also might enjoy this interesting interview [edit: no longer available] with producer and director, Vanessa Gould, about the surprising magic of origami, as well as the official trailer. Oh, thank you so much for this alert - must watch that on PBS. Thanks, Ann! Sally, thanks very much for the info. I sent out an updated post to let everyone know.